On the tray was a jar of sweet tomato jam. Between the six of us, the jar was empty by the end of our snacking and, ever since that day, I’ve been thinking about that tomato jam. Then my friend Gaby mentioned on social media that she was going to do a bruschetta bar for a party, which I then decided to do for my lip sync battle party last Friday night, giving me the perfect excuse to finally try a sweet tomato jam recipe myself. Not to brag, but the tomato jam I made was just as good as what we had at the Hyatt. And thank goodness since I pretty much constantly crave it now. So, what is tomato jam good for anyway? Everything! It’s a great topping for bread and pairs beautifully with all kinds of cheeses. It’s also a great condiment for just about anything – sandwiches, burgers, whatever your heart desires! It’s sweet but with a savory flavor to it. It’s basically pure deliciousness. Bring a large pot of water to a boil. Make an ice bath in a separate bowl and set to the side. Drop the tomatoes into the boiling water in batches, boiling for about 1 minute. Remove tomatoes from the boiling water and place directly in the ice bath. Remove the skins by hand right in the ice water, leaving the skins in the water. I would empty the ice water bowl between batches. By removing the skins in the ice water bowl you cut down on some serious messiness in the kitchen! Cut the tomatoes in half crosswise, seed them, then chop into pieces. Place chopped tomatoes in a large pot. Mix with sugar and stir well. And let stand at room temperature for about 10 minutes, stirring occasionally. Bring tomatoes and sugar to a boil over medium-high heat and let cook for 15 minutes. Add salt, pepper and parika and cook until thickened, about 10-15 more minutes. This post was sponsored by Q Squared NYC. Pictured: The Heritage Small Bowl and the Cool Montecito Tapas Plate. 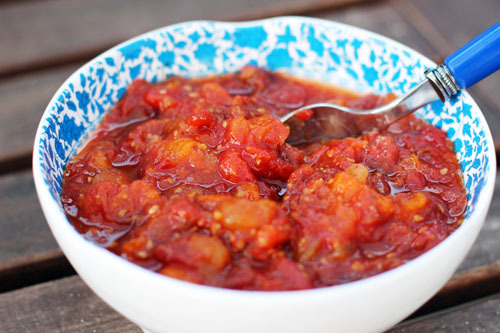 I am as addicted to my Q Squared Dishes as I am to this tomato jam, by the way! Delish!! Perfect for summer snacking. it really is! gotta love summer and the abundance of tomatoes! This looks so good, I need to try this asap for my hubby. He would go crazy for this. Love the dishes in the photos. I wanna put this yumminess on everything that I make this summer! My mom used to make tomato preserves, but they had lemon slices also. They were made with the small yellow pear tomatoes. Haven’t had them in decades. If you reduced the sugar, then it probably shouldn’t be canned. One of the reasons jam and jelly recipes can be canned easily is all the sugar. With reduced sugar and no lemon juice or other acid added, I would hesitate to can this. thank you so much for your input on this! I really appreciate it, going to make a note in the post!! Looks SO good! I adore bruschetta so I’m sure I would love this just as much! looks so yummy!! i really want to make this. I love tomato jam! The color on that is gorgeous! I am making my second batch right now. I love this jam and so does my family. It’s good on everything, even tater tot hotdish!! 🙂 Thank you for sharing it! I went to the epicurious website to get the original recipe but there are three, which one is it? it will for sure stay for 1-2 weeks! it might even last a month, but I would do a quick taste and check for mold at that point. but you should be safe for sure with 2 weeks – I know I had some for that long once. 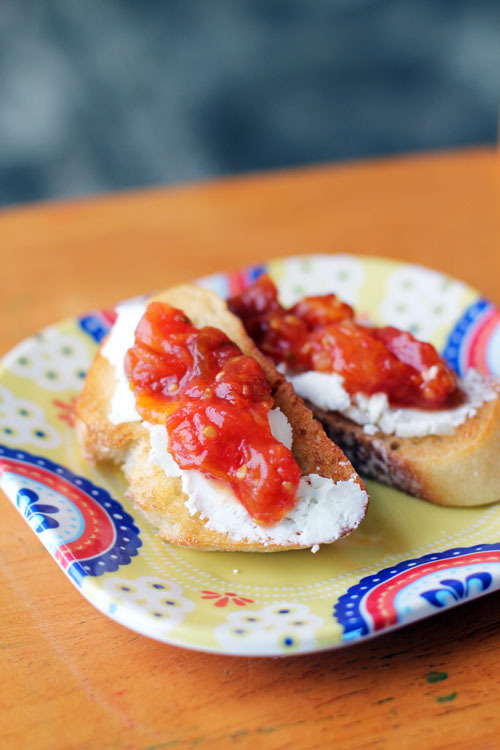 What cheese would you use on crostini with tomato jam? I freeze all of my jams and preserves. Be sure to leave the headspace for expansion in the freezer. I ate at a restaurant inside of Nordstrom’s yesterday and I had an amazing appetizer that featured a mason jar layered with ricotta, pesto and topped off with a sweet tomato jam sprinkled with bits of basil. It was served with toasted crostini drizzled in olive oil. It was beyond delicious so I knew that I would have to find a sweet tomato jam recipe to duplicate this dish or I’d have to carve time out of my busy schedule to accommodate frequent trips to Nordstrom. I’ve found the jam recipe here on this site and I can’t wait to recreate this appetizer! I had the same app at Nordstrom and have been craving it ever since. The waitress said they would email the recipe if contacted or it may be in their cookbook. My jam is delicious but not very thick. Is it supposed to be that way? Thanks! wellll….the juice around the tomatoes isn’t necessarily thick, but there shouldn’t be tons of juice. I would suggest two things – simmer the sauce longer to try to cook off more of the fluid. and if you really want it to seem thicker, maybe mix a bit of cornstarch with cold water and add that in while it’s simmering – I wouldn’t do much, but that will thicken the juices up a bit without affecting flavor. I hope this is helpful!!! Thank you for your comment. Although I wasn’t sure if it should be thicker, it was wonderful when I layered it in a jar with Ricotta, topped with Basil Pesto and then topped with the jam. I think I liked your jam better than the one at Nordstroms, which was a tad sweet. Love the smokey flavor of your recipe. Blessings! wow, love that you loved it more than nordstrom’s – score!!! 🙂 thanks for coming back to comment! Can’t wait to try it! I had tomato jam for the first time last week at a cute little sandwich shop in the Ozarks. It was on a BLT and it was delicious! on a BLT? sounds divine! hope you enjoy the recipe! When tomatoes aren’t in prime season, have you ever used canned tomatoes, and if so, what brand? Your presentation was great…want a sample right now! now, THAT is an interesting question! I have not used canned tomatoes, but if I were to use them, I think I would do two large cans (28-ounce) of whole tomatoes, drained. I personally like Hunt’s or Muir Glen. I just went to a sandwich shop and they were serving a fried green tomato blt with sweet tomato jam. It was divine. When I got home I knew I had to find a tomato jam recipe. Can’t wait to try this! Added red pepper flakes and some orange zest to deepen flavored, we eat it on grilled chicken and pork, burgers and hot dogs, even with scrambled eggs. Plan to make cheese grits for a fish fry, will be added this jam also. Love anything tomato. those sound like delicious additions! and those are all marvelous suggestions for how to use the jam – it’s making me hungry! I used to buy tomato jam at local farmers markets, and loved it, but havent been able to find it lately. It never occured to me to make my own! This sounds so easy. I am going to try using canned stewed tomatoes. let us know how the canned stewed tomatoes work out! and glad I could help you quench your cravings, farmers’ market or no! Wow this was amazing!!! I put it on a grilled cheese and bacon. (Multigrain bread and quality thick bacon) 10 different types of tomatoes- I have a feeling I will be making alot of this. um, that sounds like the best grilled cheese EVER. so glad you liked the jam! yay! Try it as a topping on a grilled cheese sandwich made with thick sourdough bread, and goat cheese mashed together with fresh basil. Make and cook the sandwich , then cut in smaller pieces. Spread a bit of the jam on top of each piece. Heavenly. that DOES sound heavenly! thank you! I am all about tomato jam this year. I have made many different kinds from different varieties of heirlooms from my garden. I LOVED your recipe”¦ so savory AND sweet! I used Aunt Ruby’s German Greens when I made it, it turned out a pretty green/gold/rust color and tastes delish. Thank you so much! so glad you loved it, and thank you for letting us know what kind of tomatoes you used!! Has anyone made this without pealing the tomatoes? I have not. Perhaps someone else will have feedback on this, so we’ll see! My gut tells me that the texture will be better with the tomatoes peeled. I personally wouldn’t change that, but if you do experiment let us know how it goes! Concerning the cornstarch comment to thicken – that’s ok, but I would suggest tomato paste. If you use a simple paste, and not an italian flavored variety, it would enhance the flavor as well. This sounds delicious – I was looking around for a jam recipe I have made – it’s in a book I can’t locate in my house – since we remodeled. tomato paste is a GREAT idea! thank you so much for commenting!!! Someone brought an Avocado to a Garden party & it was topped with Tomato jam! Looked beautiful & delicious. Must make a batch.. Thanks for sharing. 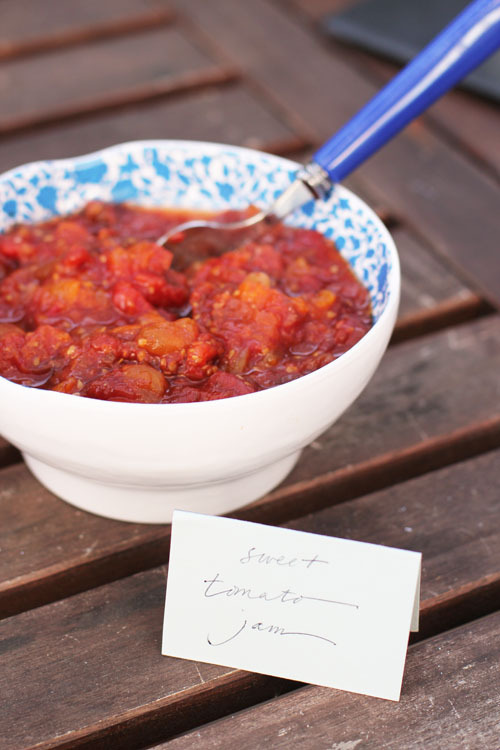 mmmmm…what a great way to use tomato jam, I’m going to try that! thank you, jana! hope you enjoy this recipe, and happy holidays to you! I used your recipe this weekend and the tomato jam is delicious! Thank you so much. your recipe is amazing.I have prepared it.my family like it very much.thank u for ur recipe. 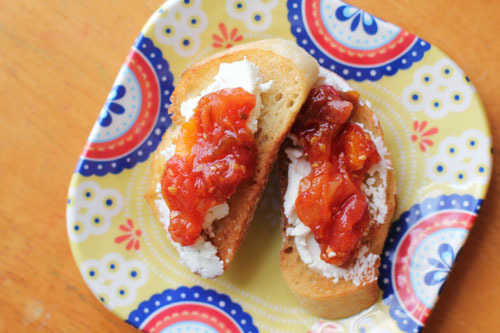 Tomato jam recipe is one of my favorite because I like the crispy smell of tomato, it’s so yummy and delicious. Have been missing my grandmother’s tomato jam and am looking forward to a nice crop of yellow pear tomatoes. So glad I found your recipe and the comments when I went searching for recipe inspiration! Thank you. Do you think that you could use canned tomatoes? I always have canned San Marzano tomatoes on hand and was curious. I’m still waiting for my garden tomatoes to ripen. Wish I didn’t add the balsamic, otherwise I think it would have been yummy! My husband and I made this jam.. And it’s the worst thing we have ever eaten.. I didn’t even put it into jars. I poured it all down the drain.. I will never make this again.. It is so gross!! Hi VC….curious what you didn’t like about the recipe. Did you think it needed more or less seasoning? 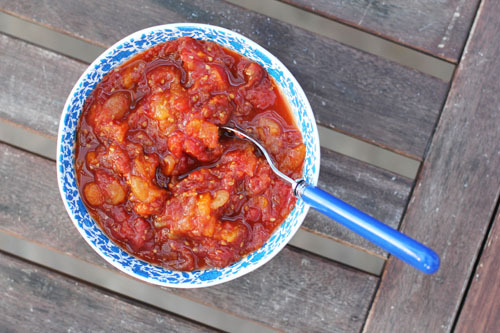 Have you had tomato jam before? Did something go wrong with the recipe or was it not what you were expecting? Would love to find out the issue, see if there is some way to help! This is a popular recipe (both here on the blog and in real life). Sorry it wasn’t your cup of tea! I used your recipe to the tee but with canned tomatoes instead of fresh…it turned out beautifully and the family loved it! It just took a little longer to boil down the excess liquid but I didn’t mind …didn’t have to drain the liquid out. i made some jam from a recipe which came out well. However, it was not sweet and will be good on something savoury. Im looking forward to trying your recipe after reading the positive comments.